I had the same questions. So I decided to get my hands on some and try them out. Keep reading to find out how I conducted my experiment, and what I found out. Verdict: Which is the Best Water Test Kit? The water at my house comes from a 185 foot deep drilled well. It's cold and clear and tastes fantastic. When my husband and I bought the house a few years ago, we were told that the water was fine. But we never had it tested ourselves. It was always in the back of my mind that I really should get it checked, just to be sure. Finally, a few weeks ago, I ordered six different water test kits from Amazon. I decided to go with kits that are well known and that are affordable for most people. Then I scheduled an appointment with a guy from the well company to come out and do some testing. He spent about an hour collecting samples and then sent them off to Nelson Analytical Lab in Manchester, New Hampshire for analysis. That same afternoon, I did all of the tests from all six kits and recorded the results. A few days later, I received the lab report from Nelson Analytical, and I sat down to go over the numbers and make comparisons. And that's where all the information in the rest of this post came from. You'll find detailed descriptions of each kit - what they test for, the methods used, and how the results I got compared to the professional lab test results. I've also included a table with all the test results so you can see how the kits compare to each other and to the professional lab. 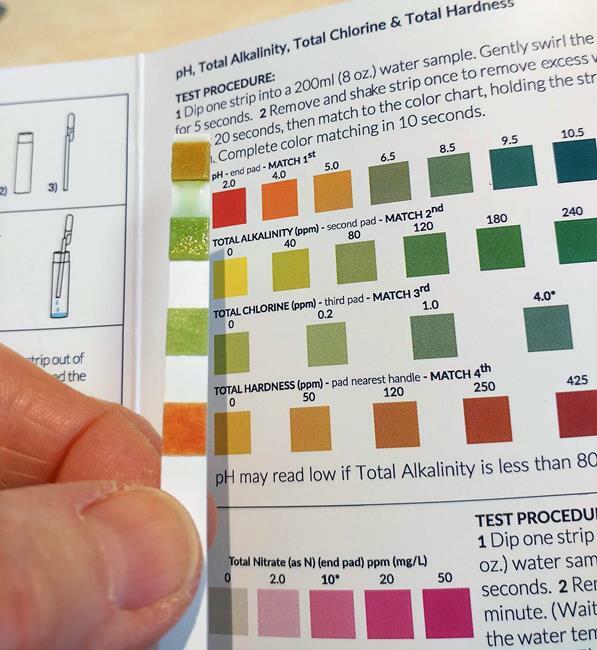 I hope you find it helpful if you're trying to decide whether to buy a water test kit. Disclaimer: I am not a scientist. I did not conduct these tests in a controlled environment. The tests were conducted in my home following the instructions in the kits. My results could be flawed due to human error. The opinions and conclusions drawn in this post are solely my own. Your results may vary. We'll start off with two all-in-one strip tests: J​​NW Direct and NovoBlue. 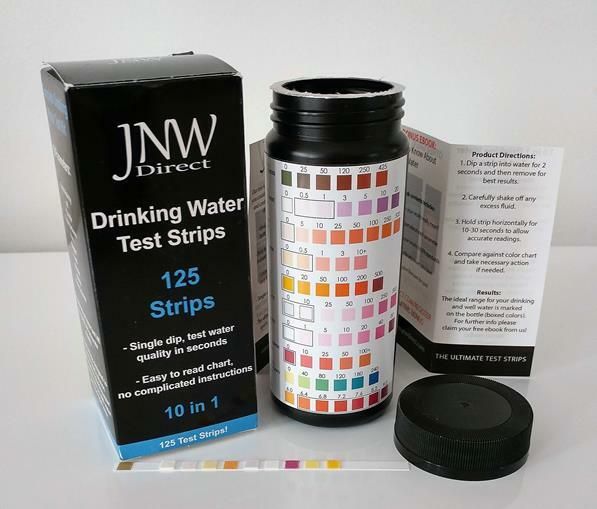 If you want an uncomplicated way to test drinking water from a municipal supply, the 10-in-1 Test Strips from JNW Direct are a good choice. Because it doesn't include a bacteria test, you won't want to use this if you're on well water. The testing method is simple. Just dip the strip in a sample of your water, wait 10 to 30 seconds, then compare the pad colors to the chart on the bottle. Once the container is opened, the strips are only good for 90 days. That's because contact with the air makes them degrade, and they won't be accurate. Chances are you're not going to use 125 test strips in three months, so maybe you could split the pack with friends. Or give them to your kids to do some science experiments! JNW Direct has a bonus Ebook for you called Information You Need To Know About Your Drinking Water when you register at their website. 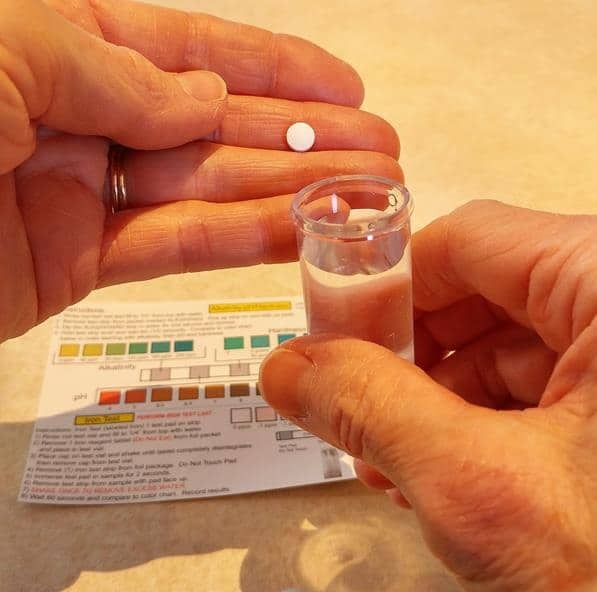 It gives more details about the different tests and what to do if the results show you have a problem with your water. Mostly it agreed where they tested the same things. However, I would not trust this for testing fluoride if that's a concern for you. The JNW Direct test detected no fluoride in my water, but the professional test measured fluoride at 1.6 ppm. That's a significant discrepancy. In addition, the JNW Direct test detected no iron, but the professional test detected iron at 0.062 ppm. The hardness was off a bit, too. And it said that the pH of the water was 6.4, while the professional test said it was 8.04. In other words, JNW Direct told me my water is slightly on the acidic side, where in reality it is alkaline. So I wouldn't trust it for testing pH, either. There is no chlorine in my well water, and the test didn't detect any. Since there are plenty of strips to experiment with, I added a tiny bit of bleach to another water sample and tested it again. This time, chlorine was detected. ​JNW Direct is a cheap and easy way to get a general idea of the condition of your water, but don't use it for hardness, fluoride or pH testing. Click here to check availability and price at Amazon. Here's another simple test that you can use for municipal drinking water. 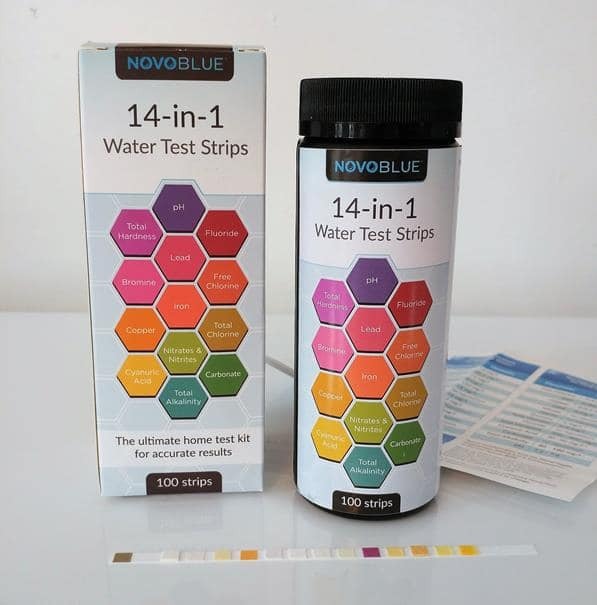 NovoBlue 14-in-1 has a few extra tests beyond what JNW Direct has, so you can also test your pool or spa water or the water in your aquarium. The method for testing is just like JNW Direct. Dip a strip in water, wait 15 to 30 seconds, and compare with the color chart. I asked NovoBlue about the expiration date. They told me that, as long as you keep the strips at 36°F to 86°F, they should last for two years even after it's opened. So there's a better chance that you'll get more use out of these than the JNW Direct ones. NovoBlue also gives you a free eBook, A Complete Guide To Water Safety for Pool, Spa, & Drinking Water, but no registration is required. The results were almost identical to JNW Direct. It detected no fluoride and no iron even though the professional test said I do have 1.6 ppm and 0.062 ppm, respectively. So, like the JNW Direct strips, I don't recommend using it to test fluoride. The hardness measured at 120 ppm while the professional test gave it a hardness of 85 ppm. And it measured the pH at 6.8, but the professional test measured it at 8.04. The result would lead me to believe that my water is a hair on the acidic side. But it's not. It's alkaline. So I wouldn't use NovoBlue to test pH, either. I did the same experiment with bleach that I did with JNW Direct, and NovoBlue did detect chlorine in the water. NovoBlue is fine for testing chlorine and lead. But don't rely on it for testing fluoride, hardness or pH. You can use an opened container for up to two years, so you can get a lot of use out of it. And now we'll look at some more complicated multi-test kits: Test First Alert, Health Metric, Test Assured, and Water Safe. The First Alert kit includes a bacteria test, so can be used to test either well water or city water. It can only be used one time, so you need to be careful to follow the instructions closely. There are two test strips. One tests for nitrate and nitrite. The other tests for pH, hardness and chlorine. Just dip, wait a short time, and compare the colors to the chart. 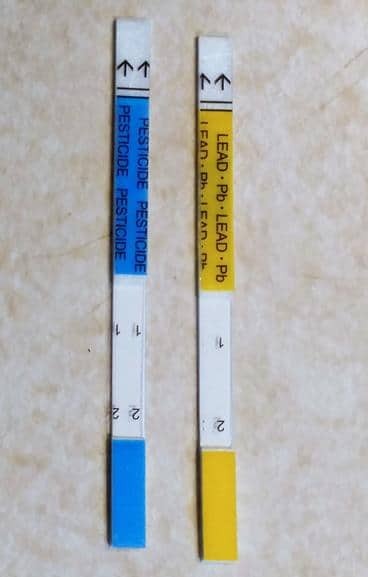 Then you've the lead and pesticide test. To do this, you have to add two dropperfuls of water to a vial, put the two test strips in, and wait ten minutes. On each strip, there are two little blue lines. You compare the lightness and darkness of the lines, and that tells you whether you have a negative or positive result. The dropper and vial are included in the kit, by the way. Finally, there's the test for bacteria. You'll have to allow 48 hours for this one. In the kit you get a sealed vial containing a bacteria growth medium. You just add water, put the lid on, and shake it well. The water will turn purple. Then, you have to put it in a warm place (70°-90°F) for 48 hours. If the color remains purple, that means there's no bacteria. If it turns yellow, there is bacteria present. This one came close to the lab test in measuring pH. The reading was 7.5 - not too far from 8.04. At least it was on the correct side of neutral (which is 7). Like most of the other tests, it was a bit off on the hardness - 120 ppm versus the professional result of 85 ppm. And, like all the other brands, it didn't detect any nitrate or nitrite, where the professional lab test detected small amounts of both. 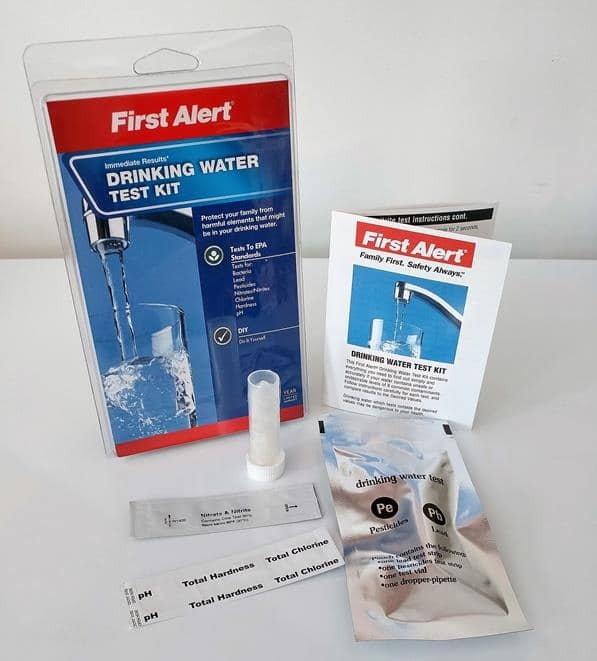 The First Alert Drinking Water Test Kit will give you reasonably accurate readings, particularly for bacteria, chlorine, lead and pH. It's the best choice for testing city water. Health Metric is another multi-test kit that can be used for well or municipal drinking water as well as aquariums. The complete test can be done one time. For some reason, though, they give you an extra nitrate/nitrate test and and extra 4-in-1 test strip. The 4-in-1 strip tests for pH, total alkalinity, total chlorine, and total hardness. Dip and swirl the strip in water for 5 seconds, then wait 20 seconds. You're supposed to complete the color matching in 10 seconds, so you've gotta be fast! There are two other test strips: one for copper, and one for nitrate and nitrate. The lead test is the same as the First Alert lead test, but there is no pesticide test with it. Health Metric doesn't test for pesticides. And the bacteria test is the same as First Alert except that it uses a larger bottle, not a vial. Here's a photo of the four bacteria tests that I did. It's winter in New Hampshire, and my house is on the cool side. So, to keep the samples above 70°F, I kept them under a heat lamp with a 60 watt light bulb for 48 hours. Health Metric comes fairly close to the professional tests, with the exception of pH. It gave my water a pH of 5, but the lab test said it's 8.04. This is a huge discrepancy! A pH of 5 is not even within the EPA acceptable standard. So, if I went by this test, I would think my water is super acidic, when in fact it is alkaline. Like the others, it didn't detect nitrate or nitrate, and it said my water has more hardness than it actually does. And it didn't detect any bacteria, which is correct. For a basic reading of your water quality, Health Metric is fine. But I don't recommend it for testing pH or hardness. 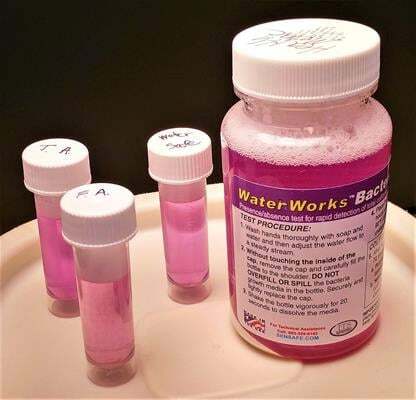 The Test Assured kit can be used once to test well or municipal drinking water. This one has five separate tests that you do. There's a bacteria test identical to the one you get with First Alert - add water to the vial, shake, and keep warm for 48 hours. Two multi-test strips are included. One tests chlorine, copper, nitrate and nitrate. The other tests alkalinity, pH, and hardness. These are the dip and wait, then match the colors kind of tests. Finally, there's an iron test that's a little different. You add an iron reagent tablet to water in a vial and shake it up to dissolve the tablet. Then you dip a strip in that solution and wait 60 seconds to read the results. One nice little addition to this kit is a refrigerator magnet. It has a space where you can write the date of the next time you want to test the water. I didn't have any trouble opening the packaging on the other kits, but this one was a different story. You wouldn't have to worry about it coming apart, that's for sure. Anyway, I managed to cut two of my fingers trying to get it open. Not a big deal, but I thought I should mention it. The bacteria test was spot on. It didn't detect any bacteria, and neither did the professional test. According to the Test Assured pH test, my water has a pH of 9. That's quite alkaline and not within the EPA standard. The professional test gave it a pH of 8.04, which is somewhat alkaline, but still within the standard. The number isn't that far off, but if I relied only on the home test, I would think I had a big problem when I really don't. Now, the hardness number was way, way off. The test said the hardness was 200 ppm, but the professional test said it's 85 ppm. 200 ppm is in the highest range of hardness (very hard) and 85 ppm is kind of in the middle and considered moderately hard. There is no EPA standard for hardness. It's considered an aesthetic effect. But if I went by the Test Assured result, I might think I need to run out and spend a couple thousand on a water softener system. No nitrate or nitrite were detected by Test Assured although the professional test did detect small amounts. And it detected no iron in the water, but the professional test said it has 0.062 ppm. Not a lot, I know, but especially if you're on a well, you want to know if there's iron in the water. 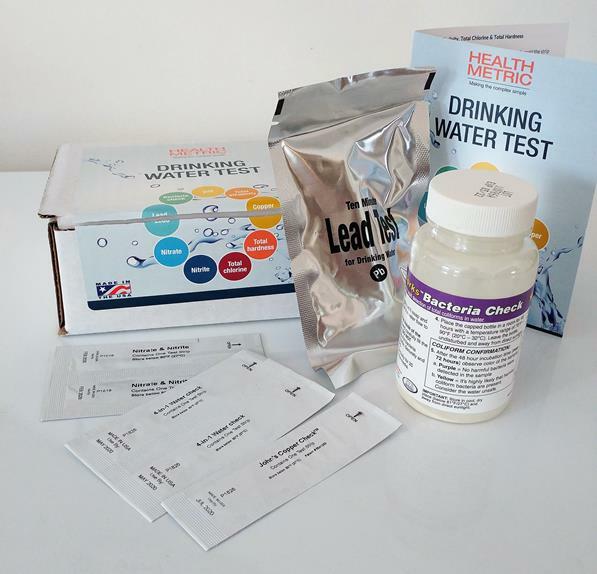 ​The water test kit from Test Assured can give you a good idea of the general condition of your drinking water. But you should probably use something else to test the hardness. 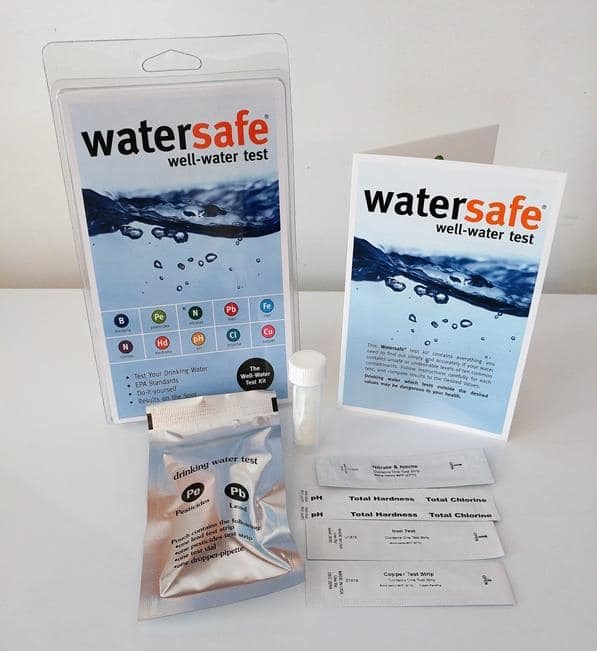 Watersafe calls their offering a well water test kit, but you can also use it for testing water from a municipal supply. You'll find six separate tests inside the kit, and they're all easy to do. Four of those are test strips that you dip in the water and then match the colors on the results chart. One strip is for copper, one is for iron, one is for nitrate and nitrite, and one combines pH, hardness and chlorine. One bacteria test - identical to the ones in Test Assured and First Alert - is included. Simply add some water to the included vial and shake. Keep it warm and then check for a color change after 48 hours. And there's a lead and pesticide test, which is also identical to the ones in the Test Assured and First Alert kits. Just add some water to the included test vial, put in the two strips, and wait ten minutes to read the results. The test results with Watersafe were almost identical to the First Alert tests. The only difference is that Watersafe tests for copper and iron, and First Alert does not. So, this one was also close to being accurate on the pH, but it was off on the hardness by 35 ppm. It didn't detect nitrate, nitrite or iron, while the professional test did detect small amounts. ​Watersafe can give you a somewhat accurate idea of how safe your drinking water is. It's especially good for testing pH, chlorine, lead, and bacteria and is the best choice for well water. Below is a table I made comparing my test results with the professional lab test results. Where it says n/a, that means the kit or lab did not test for that substance. The EPA Acceptable Level came from the professional lab test results. In that column, n/a just means that it wasn't included in the report because the lab didn't test for that substance. It doesn't mean that there is no EPA standard. Click or tap on the table to see it full size. None of the tests detected nitrate or nitrite, but the professional lab did. None of the pH tests matched the professional reading. None of the hardness tests matched the professional reading. The two that tested fluoride detected none, but the professional lab did. The four that tested iron detected none, but the professional lab did. The bacteria test results were all correct. None of the tests detected chlorine or lead. Although the professional lab did not test for these, the result is correct because we are on a drilled well (no disinfectants used) and our pipes are made of PVC. If you're going to buy a home water test kit, you should first decide which contaminants you want to test for and look for a kit that includes those things. Do you get your water from a municipal supply? Then you'll probably want to test at least for chlorine and lead. You might also want to test for fluoride if that's of concern to you. You shouldn't need to test for bacteria unless you suspect there might be a problem somewhere between the water source and your faucet. If so, you'll want to test for ​bacteria, lead, iron, fluoride, manganese, arsenic, nitrate, nitrite, and radiologicals. You won't need to test for chlorine unless your well has been disinfected. In either case you might also want to check the pH and hardness of your water. Then if it's not where you think it should be, you can take steps to correct it. Also make sure the kit tests to EPA standards. It usually states that on the outside of the package. Testing your water at home isn't hard to do. But if you use one of the single use kits, you'll want to be sure you do it right the first time. So, after having used six of these kits, I have some tips to pass along to you to make it easier for you. Read through all the instructions before you start, and follow the directions precisely. Have a timer or a clock with a second hand nearby. Timing matters! Don't open any sealed containers or packets until you're ready to use them. Exposure to air will cause them to degrade and possibly give inaccurate results. Test using cold water from a fixed faucet with the aerator removed. A bathroom faucet is the best choice. When filling small vials, pour the water from another container, or use a pipette. It's hard to not overfill them because they're so small. Matching the colors on the test strips can be tricky. If possible, check the colors in natural light. If the tests seem to indicate that you have a problem with your water, get a second opinion from a professional before you take steps to correct it. It could save you from some needless expenses. 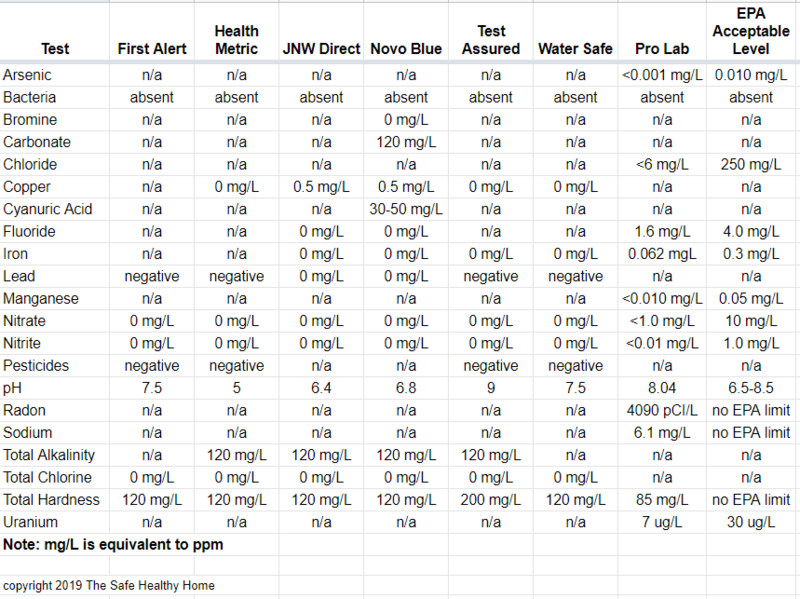 Home water test kits have their limitations, and they'll never be as accurate as tests performed in professional labs. But, they can be helpful as a first step toward diagnosing problems with your drinking water. If there's any indication that your water is not safe, you should always follow up with a professional test. Sure, you can buy more expensive home test kits that will test for a greater variety of contaminants. But, they're still going to be much more prone to human error than testing done in a lab. And, if you're going to spend $100+ on a home test, why not just have a professional do it instead? 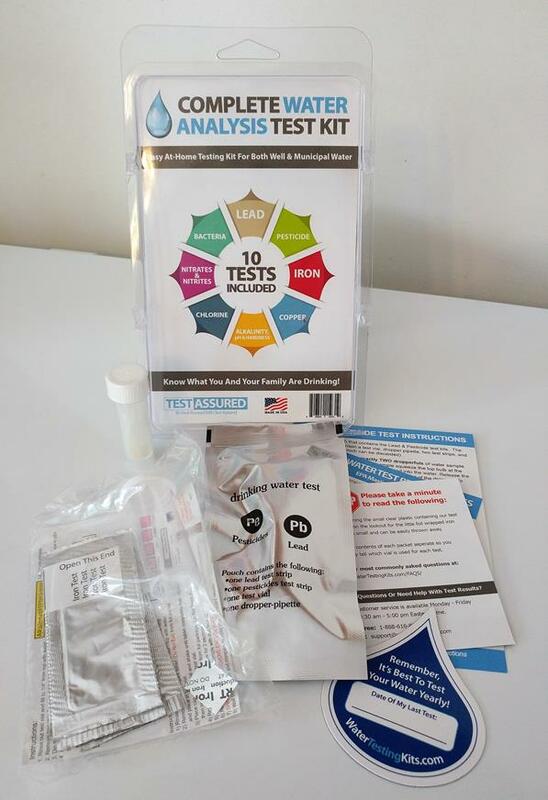 You could probably get testing done by your state health department for less than the cost of one of the fancy home test kits for sale online. So now that we've taken a closer look at these test kits and tried them out, the question is which one is the best? In terms of overall accuracy, I'd say it's a toss up between First Alert and Watersafe. If you have well water, I'd recommend the Watersafe Well Water Test Kit because it tests for iron and copper in addition to the other basics. But if you're on city water, you could go with the First Alert Water Test Kit. Check the price and availability of Watersafe at Amazon. Check the price and availability of First Alert at Amazon. If you have tried testing your own water at home, I'd love to hear about your experience. Leave a comment below and let us know how it went!